This recipe is a winner! It was so authentic and my lips are still tingling! I made modifications from the original recipe to reduce the fat. Though I normally never use only, I did use 1 teaspoon of sesame oil (for flavor) for the whole recipe. It came out fabulous! 2 T. toasted sesame seeds for garnish. 1. To make Crispy Tofu: Cut tofu block into two broad slabs. Wrap tofu slabs in paper towels, and place between two cutting boards. Weight top cutting board with soup cans, and press 30 minutes (or use a tofu press). Unwrap tofu, and cut into 1-inch cubes. 3. Preheat oven to 400°F and place on nonstick foil-lined or parchment-lined baking sheet. Sift cornstarch over tofu, and turn to coat evenly. Spread tofu on baking sheet. Bake 30 to 40 minutes, or until firm and crispy, turning several times to brown all sides. 4. To make Sauce: Whisk together broth, sugar, soy sauce, mirin, vinegar, cornstarch, tomato paste, garlic, ginger, and red pepper flakes in a medium-sized bowl. Set aside. 5. Steam broccoli and sugar snap peas (putting sugar snap peas on top of the broccoli) until just fork tender, but still bright green. Set aside. 6. Add broth mixture to a large skillet, and cook on medium high for 1-2 minutes, or until thickened. Stir in Crispy Tofu. 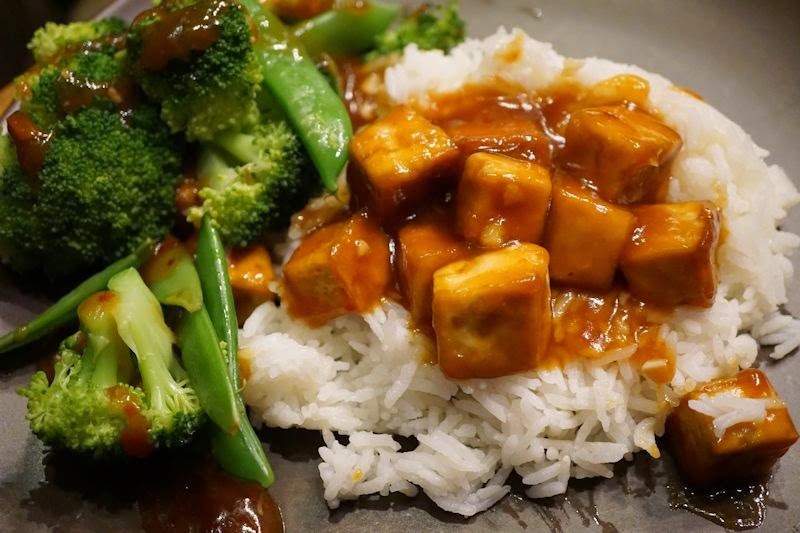 Serve with steamed broccoli, steamed sugar snap peas and rice, drizzling remaining sauce over the veggies and rice. Garnish with toasted sesame seeds. How can you say no oil when it has sesame oil?? Thank you for pointing that out, Karen. I posted the recipe before removing the oil from it by mistake. You can leave the oil out and sprinkle toasted sesame seeds on top at the end for that flavor.